Surprisingly, armour can be pleasing to the eye and still be defensive. 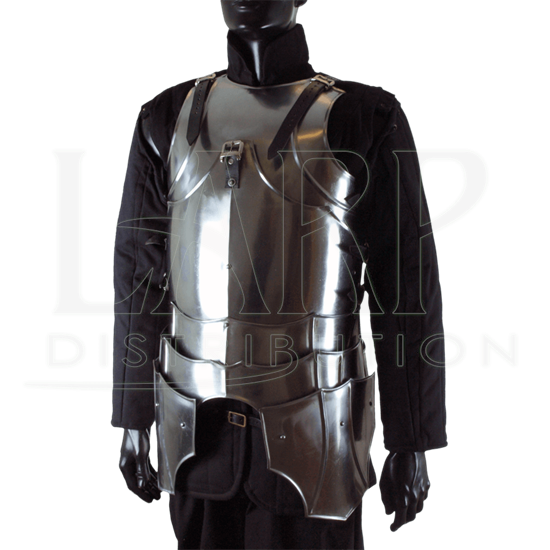 Take, for example, the Gothic Cuirass with Tassets, which provides impressive protection for the torso and thighs while featuring an attractive, 12th century style. A matching breastplate with backplate forms the cuirass. Each piece is fashioned from 18-gauge steel plates, welded together for maximum durability. Built-in faulds and tassets provide extra protection to the hips and thighs. Rolled edges and rivets increase safety and deflection. Adjust the armour to your comfort and fit with the buckle straps found at the shoulders and sides. Complete your look by combining this cuirass with the rest of the Gothic armour pieces such as the Gothic Gorget with Pauldrons. These measurements are of the armour only, and do not include the Length of the leather straps and buckles. Please keep in mind that if you are planning on wearing a gambeson or a heavily padded shirt (or anything with additional possible bulk) under your armor, you should take your measurement while wearing the garment/s and order with that number in mind for the armour.